The new DS 7 Crossback Hatchback is a key part of DC’s independence from Citroen. It’s the first ever French luxury SUV, which means that it’s pitting itself against rivals who have already been around for quite some time. On the other hand, this means it’s an exciting trailblazer looking to upset the old guard. What it can boast is a well-judged suspension setup, lots of kit and – despite a relatively high purchase price – affordable running costs. It’s also super stylish and should appeal to fashion-conscious buyers. Indeed, the brand want it to remind you of names like Louis Vuitton! DS is a relatively new marque, having been established as a luxury division of Citroen in 2010. To find out more about the history of this young car manufacturer, read our brief history of DS. OSV takes a closer look at what it’s all about with our 2018 DS 7 Crossback Hatchback review. One of the things the car is not is sharp to drive. This could present a bit of a poser for buyers, as many of its rivals in this sector can offer solid driving experiences. However, DS has put the focus on comfort here, and have fitted it with a piece of tech called Active Scan Suspension. If you know your cars, you’ll know that Mercedes use this piece of tech in their svelte S-Class. It uses cameras to monitor the road ahead, checking for lumps and bumps so that it can adjust the stiffness of the suspension. Ride quality, then, is good and it’s also worth mentioning that this car shares its basic underpinnings with the relaxing Peugeot 3008. That said, at low speeds the Crossback struggles with poorer road surfaces just like most large cars. Moreover, there are four different driving modes to choose from but the Active Scan only works if you’re in Comfort mode. Eco mode helps to keep fuel costs down a tad, while Sport mode sharpens the car’s reflexes. They never get too sharp, though. All in all, despite numb steering, the DS 7 is easy enough to drive. Its steering is precise and well-weighted, and there isn’t too much body lean. In terms of its engines, there is just one petrol available at the moment. This is a turbocharged 1.6-litre unit that develops a very healthy 222bhp. It’s smooth and quick and can cover the 0-62 sprint in just 8.3 seconds. An E-Tense plug-in hybrid model is expected to join it in the coming months. Is DS a reliable brand? Read our honest and unbiased assessment of their cars to find out more. 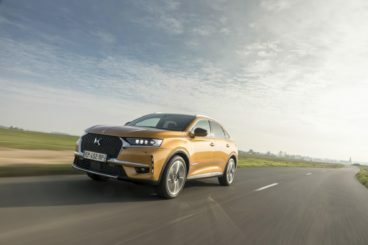 DS want this to be a large car that’s drenched in quality, and while it’s definitely the most upmarket French SUV so far, you won’t have to look too far to find evidence of cheaper, harder plastics. There are plenty of soft-touch materials present too, of course, while higher spec models come with the likes of Alcantara and leather. We have no issue with build quality either, which is excellent. And when you close the door, there’s a thud instead of a rattle. It’s pleasing, luxurious stuff. The dashboard, meanwhile, is dominated by a 12” touchscreen on all models barring the entry-level trim. It’s easy to use and bespoke graphics are easy to get used to. A 12.3” digital instrument cluster replaces analogue gauges, while other highlights include night-vision tech that’s seen for this first time in this class. Is the DS 7 Crossback Hatchback practical? It can be easy to get caught up in all the posh niceties of the car that you forget what it’s really here for. This might be an upmarket car but, aside from all that Alcantara, it does the basics well. There’s lots of space for adults up front and in the rear, although two adults will be far more comfortable than three back there. Headroom is fantastic, there are plenty of storage spaces on offer, and the boot measures 555-litres. Fold the rear seats and you can extend it to 1,752-litres. Standard kit is very generous across the range. Although the entry-level model misses out on the 12” touchscreen, what it does get are impressive 18” alloys, a leather-trimmed gear knob and steering wheel, LED front fog lights and rear parking sensors. The Performance model takes things up a notch with heated front seats, 19” alloys, sat-nav, a 12” touchscreen, tinted windows and Alcantara on the dash, door panels and seats. The Prestige model nets you a B.R.M clock, lots of leather, wireless charging and LED ambient lighting, while the Ultra Prestige model rounds things off with a panoramic sunroof, an enhanced stereo system and 20” wheels. In terms of safety, Euro NCAP awarded it 5/5 for its crash test performance. Standard kit across the range includes driver fatigue monitoring, lane keeping assistance and lane departure warning. DS Connected Pilot is standard on the range-topping trim but optional for the rest. Prices for the new car start at £28,050 and rise to £43,535. For more information on our leasing deals, you can check out our page here. In terms of its running costs, there’s just the one petrol engine on offer, a turbocharged 1.6-litre unit that develops 222bhp. Turbochargers help to keep fuel consumption respectable, and it can return as much as 48.6mpg on a good day. Emissions are pegged at 136g/km of CO2, which qualifies it for a BiK rating of 28%. It’s the first car in this class to offer night vision, and it’s also the first ever French luxury SUV. Everything about it is upmarket. Ride quality is good and the seats are nice and supportive. It’s not cheap to buy or lease, especially if you’ve already been exploring other mainstream options. There’s barely any brand heritage and this means depreciation could suffer. Let’s see how the car fares against its rivals in the comparison section of our 2018 DS 7 Crossback Hatchback review. 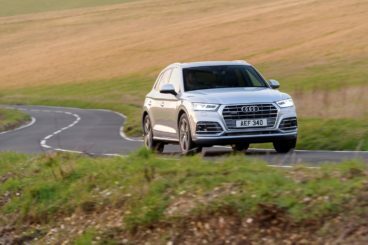 The new Audi Q5 is an established name in this sector, and the German brand have been quietly evolving it over the years so that it’s now one of the best names in this sector. Despite being such a tall car, the Q5 drives a lot like a smaller hatchback. It’s easy to drive, smooths out lumps and bumps in the road well, and doesn’t lean too much in bends. It’s definitely helped by being lighter than last time. Accurate steering enhances the driving experience too, while the brand’s Drive Mode Selector allows you to flick through various driving settings so that the car drives and feels like you want it to. However, each mode seems to come with a trade-off. For example, the Dynamic mode makes the car sharper but it also firms up the ride quality. In terms of its engines, we really like the 2.0-litre petrol unit. It develops 249bhp, feels nice and smooth, and can propel you from rest to 62mph in 6.3 seconds. Should you need more performance, a 3.0-litre V6 petrol engine powers the SQ5 model. It roars its way from a standstill to 62mph in 5.4 seconds and comes paired up with an 8-speed automatic ‘box. Running costs? The 2.0-litre petrol engine can manage returns of 46.5mpg on a good day, while its emissions are pegged at 156g/km of CO2. This qualifies it for a BiK rating of 30%. It sits in insurance group 35 out of 50, while the SQ5 model occupies group 42. Inside, the Q5’s interior is – as it ever is with an Audi – a very luxurious place. 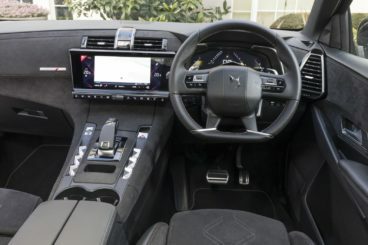 The design is minimal and elegant, build quality is sophisticated, with our only criticism being that the seven-inch infotainment display seems to be a bit too hastily fixed into place. Other than that, it’s impossible to find fault with this top-notch cabin, and Audi lead the way when it comes to aerodynamics. Insulation is also excellent. Is the Audi Q5 practical? Its ergonomics are on-point, and whoever designs these interiors genuinely thinks about how people will be using them. The glovebox is pleasingly big, as are the door bins, while all models come with a very useful multifunction steering wheel as standard. Space up front is good, and while rear seat space is mostly good, anyone sat in the middle will have to contend with a pronounced transmission tunnel. All three rear seats fold individually, while the boot measures 610-litres if you slide those rear seats forward. 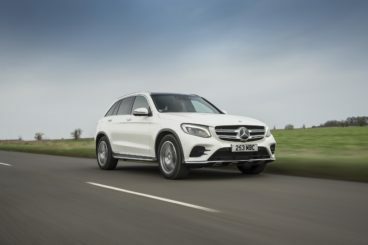 The new Mercedes GLC is another top class offering from the German brand. It offers a high-quality cabin that’s comfortable and quiet, as well as some relatively affordable engines. Like the DS, the Mercedes has not been designed with fun and games in mind. This is a comfort-focused model that comes with adaptive dampers as standard. Body lean is noticeable in bends and the steering doesn’t provide enough feedback. Moreover, it’s a little too light and definitely doesn’t encourage spirited driving in the country. On the other hand, the steering is precise and the GLC works well as a motorway cruiser. In terms of its engines, a turbocharged 2.0-litre engine is the sole petrol offering. It produces 208bhp and has a 0-62 time of 7.3 seconds. That said, there is also an AMG model that’s powered by a twin-turbocharged 3.0-litre V6 petrol engine, but it’s hardly a rival to the DS. It covers the 0-62 dash in 4.9 seconds. Both engines, meanwhile, are paired up with a 9-speed automatic gearbox. Running costs? The aforementioned 9-speed transmission helps to keep costs respectable, and you should be able to return over 50mpg on most days from the 2.0-litre engine. The AMG model, meanwhile, is good for 34mpg at best and emits 189g/km of CO2. Inside, the GLC’s cabin is well-built, plush and super comfortable. Steel springs are standard but you can enhance your car’s comfort levels even more by adding the AIRMATIC system. Insulation is impressive and the dashboard design reminds us of the classy C-Class saloon. The instruments are clear and the switchgear is solid. Then there’s the gloss black veneer that dominates the middle of the dash. Is the Mercedes GLC practical? Wide opening doors make for easy access, while the driver’s seat and steering wheel offer plenty of adjustability. Leg and headroom is reasonable in the rear but better upfront and storage solutions are good. The boot, meanwhile, measures 550-litres, which puts it on par with the DS. A large opening and a square shape make it really usable. Swedish pop group ABBA once sang a song about taking chances, and that’s what you’ll need to do here if you plump for the new Crossback. There’s barely anything wrong with the car itself; it’s practical, svelte, upmarket and very comfortable. We love it. However, it’s expensive and yet has zero brand kudos, and this will ultimately weigh on buyers’ minds. If you do take a chance on the new DS 7 Crossback Hatchback, you should be one very happy early adopter.